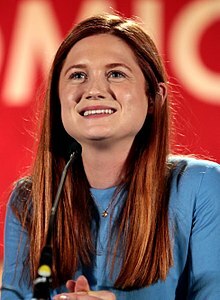 بانی رایت (اینگیلیسجه: Bonnie Wright) بریتانیالی یازیچی و اوْیونچو ۱۷ فئوریه ۱۹۹۱ ‏ میلادی تاریخینده لندن شهرینده دۆنیایا گؤز آچیب. 2001 Harry Potter and the Philosopher's Stone Ginny Weasley First live action appearance of character. Replacements, TheThe Replacements Vanessa Voice only; TV; "London Calling"
2012 Separate We Come, Separate We Go Director only, directorial debut Premiered at the Cannes Film Festival short film corner. 2014 Know Thyself Writer, Director and Producer Short film. Premiered at the New Film Makers New York at Anthology Film Archive in 2016. 2014 Fade to Gold Director Short film for LoveGold and Wright and Teague. 2018 Medusa's Ankles Short Film based on Medusa's Ankles by author A. S. Byatt. ↑ "Edinburgh premiere for Banville's The Sea". RTÉ Ten. 29 May 2013. ↑ Toronto International Film Festival – Contemporary World Cinema. tiff.net. آرشیولنیب اصلی نۆسخه‌دن on 16 August 2013. یوْخلانیلیب13 August 2013. ↑ Who Killed Nelson Nutmeg? - a children's film. ↑ O'Hara, Helen (5 March 2012). «The Awards Nominations Are Here!». Empire Online. اینگیلیسجه ویکی‌پدیاسی‌نین ایشلدنلری طرفیندن یارانمیش«Bonnie Wright»، مقاله‌سیندن گؤتورولوبدور. ( ۲۱ دسامبر ۲۰۱۷ تاریخینده یوْخلانیلیبدیر). قارداش پروژه‌لرده بانی رایت گؤره داها آرتیق بیلگی‌لر تاپابیلرسینیز.